Key Message: The use of the novel technique of teflon ring graft around the affected cranial nerve during microvascular decompression provides a long-lasting improvement in symptoms. Introduction: Various nerve compression syndromes, such as trigeminal neuralgia (TN), glossopharyngeal neuralgia (GN), and hemifacial spasm (HFS), are caused by compression of the concerned nerve by the adjacent vessel. Patients who do not respond to medical management are usually treated by “microvascular decompression (MVD) of the nerve.” Teflon patch graft is the most commonly used material for MVD. This graft has been used in various shapes like a patch, in the shredded form, or as a sling. This is done to prevent recurrence because of graft failure. We used a teflon ring graft to perform a successful MVD in 10 patients. Material and Methods: Out of 10 cases, 6 cases were of TN, 2 of HFS, 1 of GN, and 1 case was of cochleovestibular nerve compression syndrome (CNCS). After MVD, every patient underwent a follow up assessment for 5 years. Results: There was no major postoperative complication, except in the patient with CNCS who suffered from a temporary episode of facial palsy. All cases were symptom free at a follow-up duration of equal to or more than 5 years. Conclusion: Ring teflon graft may be used as an alternative as well as a safe method to perform MVD and has a good success rate. In 1932, Dr. Walter Dandy proposed the theory of vascular compression of the trigeminal nerve as a possible cause of neuralgia. Dr Janneta initially introduced MVD and popularized the technique. He placed a muscle patch between the nerve and artery. Since then, various graft materials have been used for MVD such as a muscle patch, teflon, cotton, gelfoam, thread, tape, titanium plate, and glue, as summarized in [Table 1].,,,, Teflon is, world-wide, the most commonly used graft material. Neurosurgeons have tried various shapes of teflon to achieve maximum success. The two most commonly used shapes are a teflon patch and sling. These slings or patch grafts can, however, slip due to various reasons and may cause a recurrence of symptoms. In this study, we are reporting a series of 10 patients in whom we used the novel technique of a ring-shaped teflon graft for MVD. Ten patients underwent MVD over a period of 3 years. The clinical and demographic details are summarized in [Table 2]. All these cases had a classical history of neurovascular compression syndrome. We considered MVD only in patients who (1) had received medical treatment in full doses for at least 6 months and there was less than 50% relief in symptoms, (2) had given informed consent, (3) had a recurrence of symptoms after undergoing a previous surgery (MVD/radiofrequency ablation/percutaneous rhizotomy). The diagnosis was confirmed based on the clinical symptomatology and radiological correlation on magnetic resonance imaging (MRI) of the brain with hyper-T2 (constructive interference in study state; CISS, Siemens®, Erlangen, Germany), fluid-attenuated inversion recovery (FLAIR), contrast T1 sequences, and time of flight (TOF) sequences. The severity of pain symptom was analyzed using the visual analog scale (VAS) score (0–10). The score 0 was considered when there was no pain and 10 was considered when patient had the worst possible kind of pain that he/she had ever experienced. The neurovascular conflict was classified into four categories, as mentioned by Haider et al. Simple contact: The conflict is caused by an arterial loop, which most of the times is the superior cerebellar artery (SCA), and a there is a single point of contact with the nerve. Multiple contacts: The conflict includes different points of contact by several arterial loops, most of the time related to the SCA, around the nerve. Nutcracker type of contact: The conflict includes one or more offending vessels above and below, with the nerve entangled between them. Vein contact: The most common offending vein is the Dandy vein or an inconstant and aberrant petrous vein. Recurrence: The patient had some recovery initially followed by worsening of symptoms. Each patient was operated under general anesthesia after obtaining an informed consent. MVD was done using the standard technique. A suboccipital retromastoid craniotomy was performed. The impending vessel and the nerve complex were identified. The vessel was dissected under a microscope. The ring-shaped teflon graft was harvested from the vascular tube graft [Figure 1]and [Figure 1]b, which is commonly used by vascular surgeons to repair vessels. A 1-2-mm length of the ring graft was cut out from the tube graft of 6 mm diameter. The ring was further split to open it [Figure 1]b. The split ring graft was then carefully placed around the nerve at the site of compression, as shown and explained in a case of TN [Figure 2]a,[Figure 2]b,[Figure 2]c,[Figure 2]d and HFS [Figure 3]a,[Figure 3]b,[Figure 3]c. The size of the ring was selected based upon the space available for the graft. Only one ring was used in all ten cases. The technique has been explained by a diagram to simplify it [Figure 4]a and [Figure 4]b. A male patient, aged 42 years, had a history of attacks of severe, lancinating facial pain over the left lower cheek and below the angle of mouth for the last 5 years. There was precipitation of the episode of pain on washing the face, touching the involved area, chewing, or exposure to cold breeze. There was a history of left molar tooth extraction to relieve pain. He was taking carbamazepine 300 mg thrice a day and gabapentin 300 mg twice a day for the last 3 years;there was, however, no relief in the severity of pain for the last 3 months. On examination, he had no neurological deficits. Constructive interference in steady-state (CISS) sequence of MRI brain showed the loop of left SCA compressing and pushing the trigeminal nerve. The patient underwent MVD of the trigeminal nerve. Surgery was done under general anesthesia in a sitting position. A left retromastoid suboccipital, retromastoid craniotomy was undertaken. The cerebellum was retracted. The trigeminal nerve along with aberrant SCA loop was visualized. 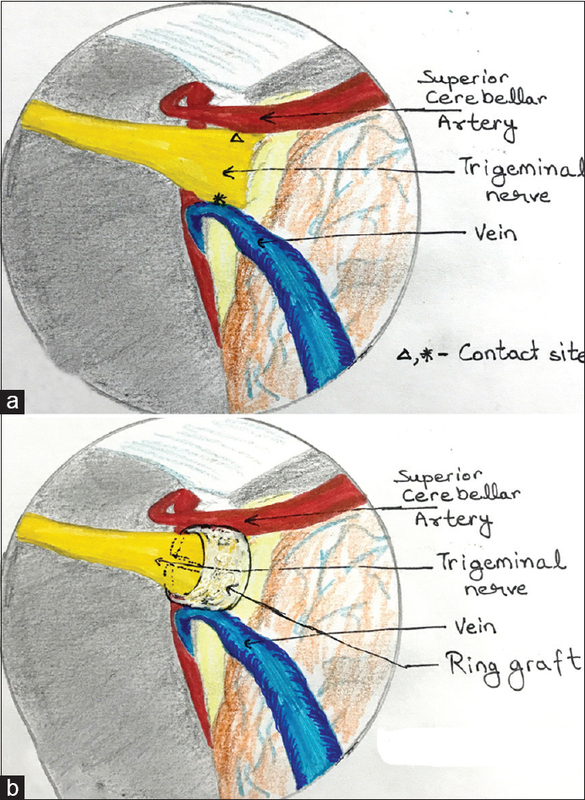 The SCA loop was present above the trigmeinal nerve and a vein was present below it [Figure 2]a. Both were pressing and stretching the nerve near its origin. An arachnoidal dissection was done to mobilize the arterial loop and vein. 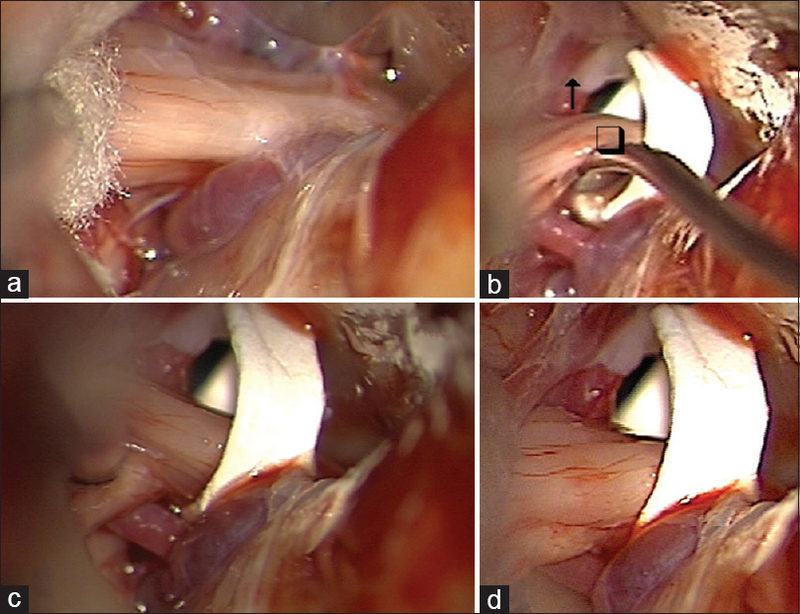 A ring-shaped teflon graft (6 mm diameter and 3 mm wide) was placed around the trigeminal nerve [Figure 2]b,[Figure 2]c,[Figure 2]d to separate it from the SCA loop and vein. The patient experienced a significant relief from the repeated attacks of pain in the immediate post-operative period (VAS 1/10). There was no neurological deficit and he was discharged after 7 days. At the follow-up visit after 1 month, the patient had no pain episodes. On a serial follow-up, there was no recurrence of pain and the patient remained pain -free at the 5-year follow-up. In this study, there were ten cases of nerve compression syndrome [Table 1] treated by MVD. Six patients had TN, 2 HFS, 1 GN, and 1 CVNCS. The compressing vessels included six SCAs, three AICAs, and one PICA. Four patients had type 1 conflict, 4 had type 2 conflict, and 2 had type 3 conflict. No patient had type 4 conflict. All patients had complete resolution of symptoms (type 1, 100% relief) after 5 years of follow-up. The patient of CVNCS developed a House and Barackmann grade II facial palsy in the postoperative period. She was taught facial muscle exercise, following which the palsy completely resolved in 4 months. No other complications were reported in the remaining patients. The offending vessel causes pressure on the root entry zone of the nerve and precipitates neuralgia. It is initially treated by medicines such as carbamazepine, gabapentin, and amitriptyline. These medicines give relief for some time, but long-term results are poor due to worsening of symptoms and side-effects of drugs, e.g., hyponatremia and leucopenia., In about 50% of patients, some sort of surgical treatment is needed. There are various surgical options for alleviating nerve compression syndromes, including MVD, rhizotomy and nerve blocks. MVD is the most popular and effective surgical treatment. The efficacy of MVD is around 65–80%.,,,,, MVD is the most popular and effective surgical treatment. The efficacy of MVD is around 65–80%., as reported by various studies.,,,, MVD may fail due to slippage of the graft, development of adhesions between the vessel and the nerve, the development of a graft granuloma, or the graft placing pressure on the nerve.,,,,,, Continuous research and efforts are ongoing to increase the efficacy of MVD. 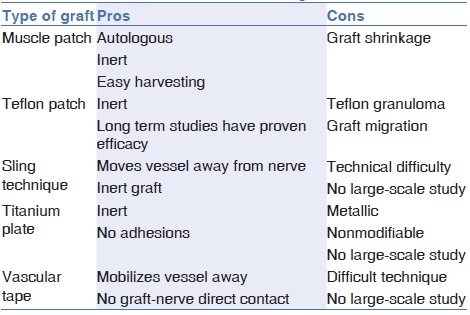 A polytetrafluoroethylene or a teflon graft is usually the material of choice for MVD because it is inert, well-tolerated in the nervous system, resistant to resorption, and has a lower complication rate than other materials. However, recent studies have shown that it is not that inert and can form a granuloma.,,,,, Teflon graft is generally used by making a sling around the offending vessel or nerve. The sling can, however, slip due to pulsations of the brain, cerebrospinal fluid (CSF) flow, and a poor sling memory. This results in a recurrence of symptoms. According to Cohen-Gadol, an unshredded teflon graft can get dislodged easily and hence a shredded graft should be used. We also suspect that failure of MVD may occur due to the teflon patch migration as a result of CSF and arterial pulsations. According to Hana et al., failure in the surgical managment of HFS can also occur due to change of body postures and due to activities that may cause an indirect mild compression as a result of the decompression material coming in contact with the nerve, or the CSF pulsations causing displacement of the graft. This results in recurrence of symptoms. To prevent the graft slippage, some surgeons use the anchoring/wrapping of graft around the artery using stitch or glue, which again does not ensure its non-migration.,, Our technique of using a ring-shaped graft has the advantage of lesser chance of slippage and the single graft protecting the nerve circumferentially. This also takes care of compressions due to multiple vessels (the nutcracker contact or multiple contact). While utilizing a teflon patch graft, a delayed recurrence may occur due to compression by a new vessel at a different surface of the neve. However, the ring graft may also prevent this late recurrence by preventing contact of the REZ with the new vessel (vein or artery) due to the circumferential cover provided to the nerve surface. Due to these advantages of our technique, there was no recurrence of symptoms seen in any of the reported cases. There are a few limitations of our study. There were only 10 cases recruited in the study. There are a few reports of the formation of a teflon granuloma that causes a recurrence of symptoms.,,,, In our ring graft technique also, the teflon ring graft is placed around the nerve. It might cause granuloma formation or compression of the nerve. Further long-term follow-up studies with large numbers of patients are needed to predict its success or failure. MVD using a ring teflon graft is an alternate and safe method for the management of various types of neuralgia. A large-scale study is needed to statistically confirm its efficacy over the regular teflon patch graft for MVD. 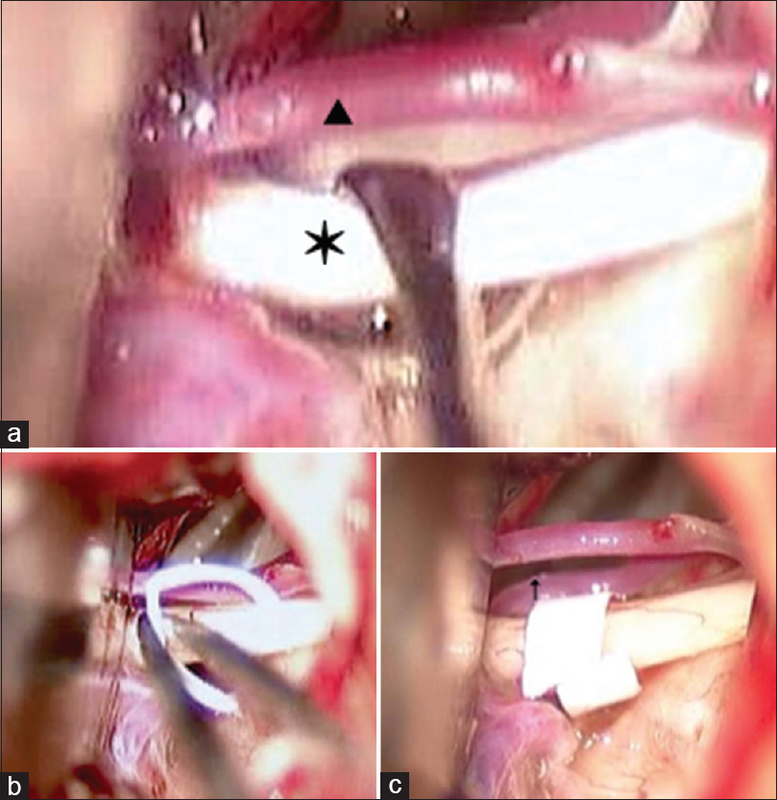 Hitotsumatsu T, Matsushima T, Inoue T. Microvascular decompression for treatment of trigeminal neuralgia, hemifacial spasm, and glossopharyngeal neuralgia: Three surgical approach variations: Technical note. Neurosurgery 2003;53:1436-43. Za Tong J, Zhu J, Sun H, Dou NN, Wang YN, Ying TT, et al. Microvascular decompression surgery: Surgical principles and technical nuances based on 4000 cases. Neurol Res 2014;36:882-93. Schwaber MK, Hall JW. Cochleovestibular nerve compression syndrome. I. Clinical features and audiovestibular findings. Laryngoscope 1992;102:1020-9. Gradient PM, Smith JH. The neuralgias: Diagnosis and management. Curr Neurol Neurosci Rep 2014;14:459. Shibahashi K, Morita A, Kimura T. Surgical results of microvascular decompression procedures and patient's postoperative quality of life: Review of 139 cases. Neurol Med Chir (Tokyo) 2013;53:360-4. Moller MB, Moller AR, Jannetta PJ, Jho HD, Sekhar LN. Microvascular decompression of the eighth cranial nerve in patients with disabling positional vertigo: Selection criteria and operative results in 207 patients. Acta Neurochir (Wien) 1993;125:75-82. Brackmann DE, Kesser BW, Day JD. Microvascular decompression of the vestibulocochlear nerve for disabling positional vertigo: The House Ear Clinic experience. Otol Neurotol 2001;22:882-7. Ammar A, Lagenaur C, Jannetta P. Neural tissue compatibility of teflon as an implant material for microvascular decompression. Neurosurg Rev 1990;13:299-303. Masuoka J, Matsushima T, Kawashima M, Nakahara Y, Funaki T, Mineta T. Stitched sling retraction technique for microvascular decompression: Procedures and techniques based on an anatomical viewpoint. Neurosurg Rev 2011;34:373-9. Ichikawa T, Agari T, Kurozumi K, Maruo T, satoh T, Date I. “Double-stick tape” technique for transposition of an offending vessel in microvascular decompression. Neurosurgery 2011;68:377-82. Banczerowski P, Czigleczki G, Nyary I. Long-term effectiveness of an ad hoc tailored titanium implant as a spacer for microvascular decompression in the treatment of trigeminal neuralgia caused by megadolichoectatic basilar artery anomaly: 9-year follow-up. J Neurosurg 2014;121:1492-6. Suzuki S, Tsuchita H, Kurokawa Y, Kitami K, Sohma T, Takeda T. New method of MVD using a vascular tape for neurovascular compression involving the vertebrobasilar artery-report of two cases. Neurol Med Chir (Tokyo) 1990;30:1020-3. Haidar H, Montava M, Collin M, Lavieille JP. Endoscopy-assisted microvascular decompression for trigeminal neuralgia: The prognostic impact of interposing material. Int Adv Otol 2014;10:107-12. Xia L, Zhong J, Zhu J, Wang YN, Dou NN, Liu MX, Visocchi M, Li ST. Effectiveness and safety of microvascular decompression surgery for treatment of trigeminal neuralgia: A systematic review. J Craniofac Surg 2014;25:1413-7. Moller AR. Vascular compression of cranial nerves. I. History of the microvascular decompression operation. Neurol Res 1998;20:727-31. Goya T, Wakisaka S, Kinoshita K. Microvascular decompression for trigeminal neuralgia with special reference to delayed recurrence. Neurol Med Chir (Tokyo) 1990;30:462-7. Ishibashi H, Matsushima T, Natori Y, Iwaki T, Fukui M, Fujii K. Recurrent trigeminal neuralgia due to granulomatous change of prosthesis for microvascular decompression. A case report. Jpn J Neurosurgery 1997;6:498-502. Jannetta PJ, Bissonette DJ. Management of the failed patient with trigeminal neuralgia. Clin Neurosurg 1985;32:334-47. Kureshi SA, Wilkins RH. Posterior fossa reexploration for persistent or recurrent trigeminal neuralgia or hemifacial spasm: Surgical findings and therapeutic implications. Neurosurgery 1998;43:1111-7. Premsagar IC, Moss T, Coakham HB. Teflon-induced granuloma following treatment of trigeminal neuralgia by microvascular decompression. Report of two cases. J Neurosurg 1997;87:454-7. Cohen-Gadol AA. Microvascular decompression surgery for trigeminal neuralgia and hemifacial spasm: Naunces of the technique based on experiences with 100 patients and review of the literature. Clin Neurol Neurosurg 2011;113:844-53. Tobishima H, Hatayama T, Ohkuma H. Relation between the Persistence of an Abnormal Muscle Response and the Long-Term Clinical Course after Microvascular Decompression for Hemifacial Spasm. Neurol Med Chir 2014;54:474-82.